Thanks to some extremely zealous Bernie Sanders supporters, the Nevada State Democratic Convention this past weekend was a particularly epic disaster, devolving into yelling, graffiti, chair-throwing and many, many threats and insults phoned in to Democratic State Party Chairwoman Roberta Lange. Yesterday, we called some of the threat-makers back, to get some insight into why they thought that was a good plan. Our own Stassa Edwards had a very good explainer of how, precisely, things went batshit, but in short, 64 Sanders delegates at the convention were disqualified, according to the state party, either because they failed to show up, failed to register as Democrats by May 1, or because they didn’t respond to attempts to confirm their phone numbers or addresses. Soon afterwards, Lange’s cellphone number was posted online, and the local offices were vandalized. 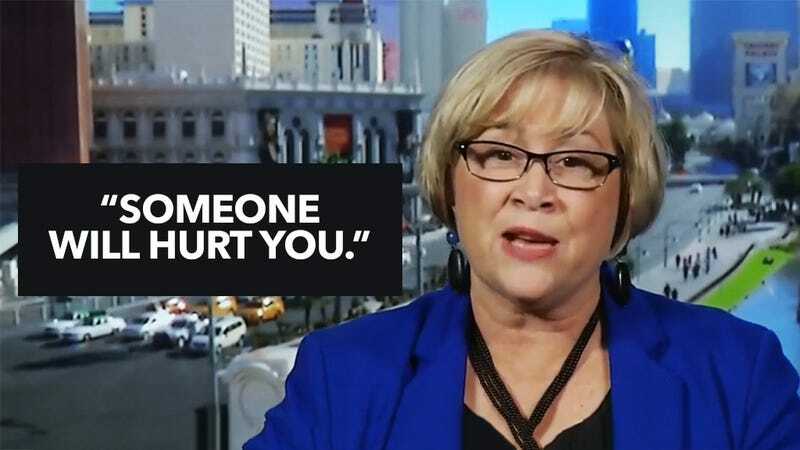 In a formal letter of complaint written to the Democratic National Committee, the Nevada Democratic Party said Lange has received hundreds of insulting and often threatening calls and texts. The letter said, too, that they feared the same behavior will happen again at the Democratic National Convention in Philadelphia in July. We write to alert you to what we perceive as the Sanders Campaign’s penchant for extra-parliamentary behavior—indeed, actual violence—in place of democratic conduct in a convention setting, and furthermore what we can only describe as their encouragement of, and complicity in, a very dangerous atmosphere that ended in chaos and physical threats to fellow Democrats. Indeed, the threats to the Chair of the Nevada State Democratic Party are ongoing at time of this writing, as Sanders activists have posted her cell phone and home address online, and have bombarded her with threats to her life and the safety of her family. We have attached some examples of this conduct, which is not merely offensive but obviously criminal in nature. We can provide audio of threatening phone calls made directly to the Chair, which now number in the hundreds. The state party also released a Dropbox folder that had links to some of the texts and voicemails Lange received. Our campaign has held giant rallies all across this country, including in high-crime areas, and there have been zero reports of violence. Our campaign of course believes in non-violent change and it goes without saying that I condemn any and all forms of violence, including the personal harassment of individuals. But, when we speak of violence, I should add here that months ago, during the Nevada campaign, shots were fired into my campaign office in Nevada and apartment housing complex my campaign staff lived in was broken into and ransacked. As this story got more airplay, I found myself increasingly curious about the angry texters and voicemail-leavers—as someone who voted for Bernie Sanders myself, as someone who’s been the subject of a variety of colorful threats over the years, and, most of all, as someone who has a sneaking and rapidly elevating sense that the pissed off chair-throwers aren’t making any of us look very good. Sanders has harnessed the support of a variety of fiery young progressives, which is a great thing—right up until they start texting an elected official and saying they wish she’d be shot in the face. So, late yesterday afternoon, I phoned nine people who’d texted Lange insults or threats. I reached three of them. Atlanta Man declined to give his name when I reached him. He sounded weary and embarrassed. He said he’d been getting phone calls all day. “What was your actual intention?” I asked. I asked if he would’ve done the same thing if he knew people would be able to call him back. “You sound bummed out,” I said, because he really did. “I hope I’m the last call you get,” I told him. “Me too,” he said, meekly, and thanked me before we hung up. The young couple were thrilled I was calling, telling me it proved they’d helped draw attention to the fishiness of the convention process. “I look at corrupt third-world countries,” the husband told me. “This is the kind of stuff that happens in those countries.” He briefly explained the delegate system to me as he saw it, before excusing himself to finish some work before leaving on the honeymoon. The person who sent that one is a 26-year-old named Ethan with a Wisconsin area code, although he assured me the number was fake (and, I assume, the name was as well). “Do you know what the concept of Anonymous is?” he asked me, immediately. I said that I did. Ethan explained he’d been undertaking an Anonymous-esque action, but also, that he was trying to play a threatening character deliberately, to send a message. Ethan’s purpose was to represent angry people, he told me, not to express his own views. I told him I thought anyone would probably be alarmed by those texts; that I, as someone who voted Sanders, found them alarming and wrong-headed and a generally bad response to a convention that didn’t break Sanders’ way. “I understand where you’re coming from,” he replied. “But people are getting frustrated and I only have $300 to my name. I have no ability to get anymore help than I can. I’ve been working and breaking my back over this,” he said, meaning supporting Sanders. I told Ethan that to me he sounded frustrated and disaffected and a little lonely. I asked if maybe Lange had come to stand in for a whole bunch of things that weren’t working well, personally and politically. “Who are you talking to?” and older woman’s voice shouted worriedly from the background.